When having your tile roof repaired it is critical that the roofer is willing to take the time to do everything correctly. 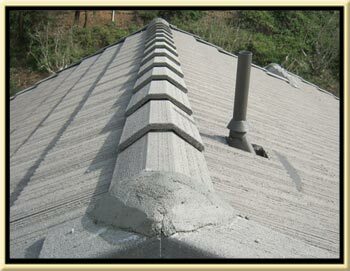 Tile roof repairs done correctly should never leak again. 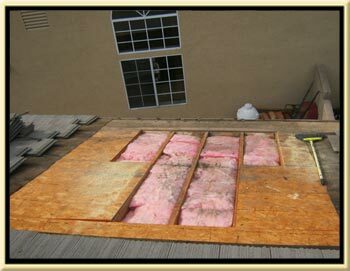 But, you have to make sure that any dry rot or termite damaged wood is replaced and that the insulation under the damaged wood is checked as well. As you can see in the picture all of the roofing felt paper has been removed. Do not let someone repair your roof unless they included removing all of the damaged felt paper. Without the felt paper removed the plywood decking cannot be properly checked and you could be stuck with terrible mold and dry rot issues deep in your ceiling and that could cause health issues and reduce the air quality in your home. We always make sure we are prepared to change any necessary dry rot or termite damaged wood including the plywood, fascia, eave board, and any trim boards behind the gutters. We know how remove your existing gutters to give us access to the wood that needs to be replaced and we will put the gutters back in place. We do use a level for when we install gutters and because of this the gutter can even function better after we have removed and re-installed it because the previous installer didn’t take the time to properly level the gutter and make sure the water is pouring into the down spout. Here you can see we installed all new roofing felt over the roof leak area. Most roofers prefer to simply remove a few tiles and immediately start installing new felt over the problem area “hoping” they have covered the full extent of the roof leak. Without removing the roofing felt you can’t find the leak source and finding the roof leak source is critical to your roof repair. 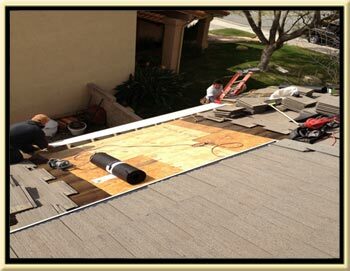 Our method is to carefully remove and safely stack the roofing tile for later re-use. 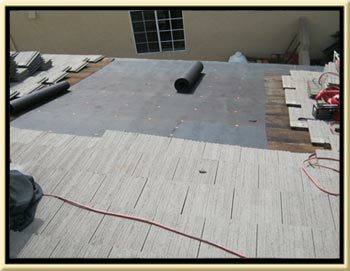 Then our journeyman roofers will skillfully cut out the damaged roofing felt. This ensures you will not be calling back soon after because of new leaks very near the old leaks because the contractor did not do a large enough area of removal. We then inspect the decking and replace any necessary dry rot damaged plywood, or termite damaged eave board, trim, or fascia. Re-pounding all the nails holding down the plywood is critical because when the plywood gets wet it will swell and the nails holding it down start to back out. This minor backing out will cause the nails to damage the new roofing paper making the new roof repair fail again. Then we expertly install new paper with time tested water proofing techniques that allows us to warranty you repair with a 3-5 year “No Leak” roof repair warranty. We recently bought a home with some minor roof damage, or so we thought. We could see a couple cracked tiles and some that had slipped out of place from our upstairs windows. What we could not see was what Brian and South County Roofing saw when they came for an inspection. They found that one tile that was not visible from anywhere except the roof had left a section of roof exposed so long that the felt underneath had been compromised and a big portion of the plywood had begun to rot. Brian took many pictures and provided a nice and professional presentation through a web link. There was an explanation and proposal of repair work with each image. When they went to fix the roof they removed all the tiles in the area all the way down to the gutter to be sure that they got it all. They ended up replacing a large portion of plywood, and some of the fascia and eaves along the edge which had all begun to rot. The tiles they brought to replace the broken ones seem to be an exact match. They also removed some roof tar that was cracking in areas and replaced it with mortar which is what it originally should have been sealed with. The crew did a great job and didn't leave a mess. It took almost a day longer than expected but Brian kept to his original estimate which was very reasonable. I will say that it took a few days and a couple messages for me to get a hold of him originally. I had decided through the other reviews here on Yelp that I definitely wanted a proposal from them. But when Brian finally called me back he explained that he is a small business that is quite busy. And now after having them complete the job I can understand why. It was worth the extra patience.